Marvel's Big Hero 6 universe is one of the most distinct they've ever created. A futuristic blend of San Francisco and Tokyo, it looks like nothing else and I'm still upset we haven't seen it in a live-action film as part of the MCU. Fortunately, we'll be able to experience it in a whole new way as part of SquareEnix's long-awaited Kingdom Hearts 3, and it's featured in the latest trailer. I'll be honest, as hyped as I am to see Big Hero 6 in this footage, I'm sick to death of waiting on this game. It's been years, far too many years, and every time we fans reach peak frustration they put out some gameplay footage to appease us. That said, this looks so fun I can hardly stand it. 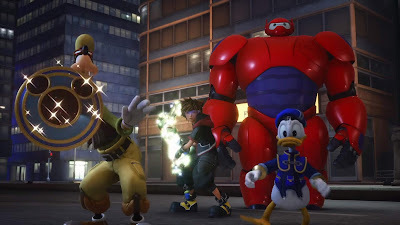 We get to see Baymax and Hiro teaming up with Sora, Goofy, and Donald as they teamup to save the world. Even here Baymax can't help introducing himself as a personal healthcare companion. Kingdom Hearts 3 hits PS4 and XBox One on January 25th 2019. I'll believe it when I'm actually booting the game up to play.